The Brazilians are proud of their homeland and flag, that was officially adopted in 1889. 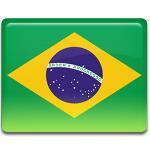 The anniversary of adoption of the flag is celebrated in present-day Brazil as Flag Day annually on November 19. The current flag of Brazil was officially adopted on November 19, 1889 after the proclamation of the Republic. A new flag replaced the flag of the Empire if Brazil. The new flag resembles the flag of the Empire, that was caused by the intention to underscore continuity of national unity during the transition from a constitutional monarchy to a republic. The flag was modified only once in 1992, six stars were added to the celestial globe, representing newly created states. There is no official declaration of the meaning of the colors of the flag, but according to a popular belief green stands for forests, white means the desire for peace, blue symbolizes the sky and Brazilian rivers and yellow stands for country's riches. The stars of the flag represent certain stars and constellations, that are observed from Rio de Janeiro. There are 27 stars, that represent Brazilian states and the Federal District. Flag Day isn't celebrated as the public holiday in Brazil, however special ceremonies are held. One of them includes singing the Brazilian Flag Anthem, that is dedicated to the flag.